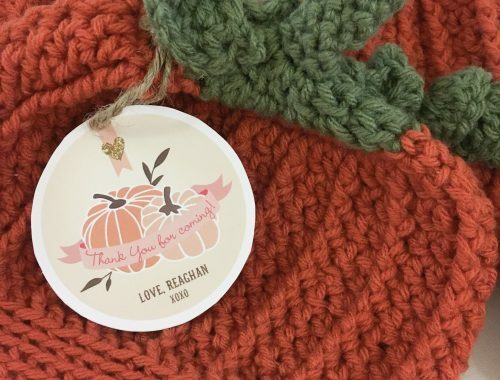 Our daughter turned one last fall. 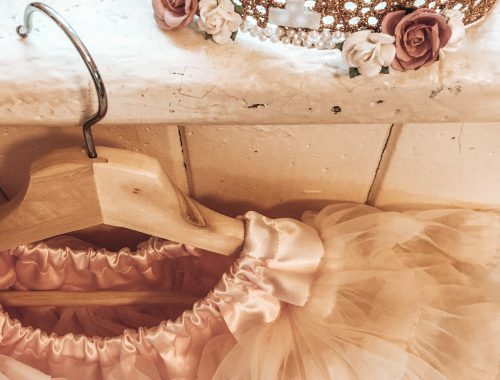 Of course, I had a big birthday party planned for her on the week-end following her birthday but we really wanted to do something special and fun on her actual birthday. 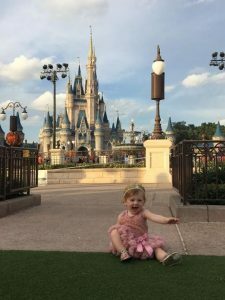 When my husband suggested taking one last family trip before my maternity leave was over to Disney World for Reaghan’s first birthday celebration, I practically jumped out of my seat with excitement! 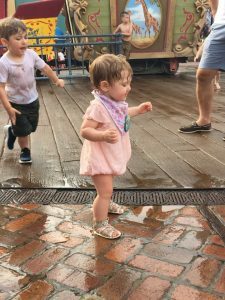 Disney World is such a magical and exciting place; it was the perfect way to celebrate our sweet baby girl’s first birthday! Since things were incredibly busy at the time between Dave’s regular work schedule, trying to finish the renovations (a complete gut and re-build job) at the investment property we bought earlier that year (more on that another time! ), planning a birthday party for 50, getting ready to go back to work, oh and being full-time parents (I’m exhausted just remembering it! ), we decided to keep our trip super short and only go for 4 days (which included our 2 travel days!). That left us with one day to spend by the pool at the hotel and one day to visit Magic Kingdom. So, to say we needed to be efficient with our time in the park and figure things out quickly would be a real understatement. 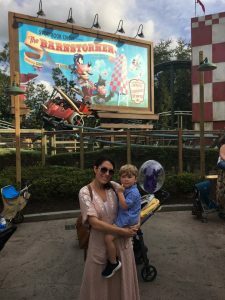 As a result of the time crunch, though, we learnt a lot about how to best navigate Magic Kingdom with two little ones in tow! 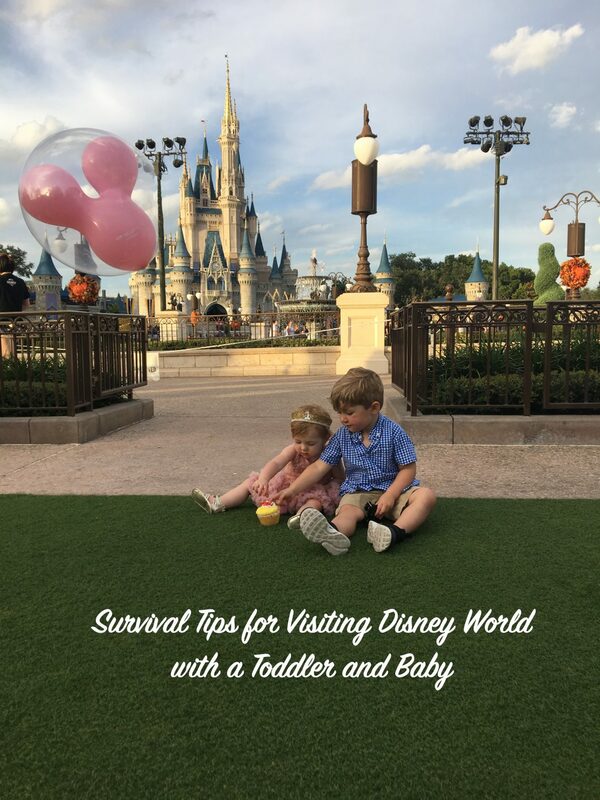 Here are a few things we learnt for you to consider for your trip; hopefully they help make your visit to Magic Kingdom both magical and a little bit easier! And don’t forget to check out my tips for flying with kids post to make the journey there a tad easier as well! 1. Stay Nearby (Preferably right at Disney World): If we had to do the trip all over again, probably the only thing I would change is that we would stay right at Disney World instead. We did stay really close by, but because we found the process of getting to/from the park to be so long (we took our hotel shuttle then the ferry at the park and it took over an hour and a half from when we left our hotel room until we were physically in the park!) and such a debacle (we waited for well over an hour at the end of a very long day with two exhausted kids for our shuttle to get back to our hotel! ), and because we were there for such a short time, it would have been more convenient had we been right at the park. This option definitely makes sense if you have young children who need to nap (especially if they don’t nap well on the go), take breaks, etc. because you can quickly (and easily!) go back and forth between the park and your hotel. I also think it makes sense if you are staying for a longer period of time as well if you intend to break up your park visits over multiple days. (i) Both of my littles are more likely to nap in the BOB than in an uncomfortable tiny umbrella stroller. We just don’t have kids that will sleep anywhere! My son in particular doesn’t nap well “on the go” anymore but he definitely needs a nap of some length every day. Especially on a day at Disney World where it’s sensory overload from the minute you walk in. So I wanted to do whatever was necessary to ensure that nap happened! As it turns out, he did sleep in the BOB for just under an hour, which isn’t anything to write home about but was enough to take the edge off; my daughter ended up doing both her naps on me in the carrier. So, depending on what your nap plans are (stay at the park, head back to the hotel, skip it, etc. ), and how well your littles sleep on the go, this may impact what you decide to bring with you for “wheels” in the park! (ii) Both of my littles can technically ride in the BOB if need be. My daughter sits in the seat part with the belt on and my son can actually sit in the little triangular space above the front wheel. It’s not the most comfortable spot to be so he doesn’t care to ride there for long periods of time, and he isn’t strapped in so we have to be extra careful, but it works perfectly fine in a pinch (if both happen to want a break at the same time). Although a double stroller would be more ideal for joint “break time”, we don’t own one (unless you count the double Chariot I have for running!) because it is just one of those things we wouldn’t get much use out of (our kids prefer to walk whenever possible), and I didn’t have any interest in borrowing or renting one because I didn’t think we would get enough use out of it (as mentioned, I much prefer to baby wear!) and I honestly felt it would be way too big to push around the park. After having navigated Magic Kingdom with our BOB, I can confidently say I would not have wanted anything any bigger than that but I totally get how that trade off is worth it to some people for the extra space! I should also mention that you can rent strollers at Disney World as well, but I do not know much about this option because we were comfortable bringing our own stroller so I didn’t look into it. If you do intend to bring your own stroller, I would just suggest bringing something with you to put on it (ex: bright tape for around the handlebar) that will identify it as yours in the sea of strollers (sometimes staff move strollers around to open up “parking” so it is highly possible someone could mistake your stroller for theirs if there isn’t something identifying on it!). 3. Avoid the Lines. Listen, you are going to a massive amusement park; there are going to be lines. But I highly recommend if you are travelling with young ones to avoid as many of the big line ups as you can. Download the glorious Disney World app (I honestly loved this app; I wish I could get one for my everyday life!) and use it! Especially for the Fast Passes. Don’t even hesitate on this one. Let me repeat: download the app and use the passes! These things are life savers when you have young kids! I’m sure you are thinking “What are Fast Passes?”. In short, they are tickets that give you a one hour window during which you can show up to go on a specific ride; you typically still wait in some sort of line but it is always way, way, way shorter than the regular lines (maybe 10-20 minutes versus +1 hour)! Amazing, right? See, I told you. These bad boys are made for parents of small children. Now I’m sure you are thinking “How do I get these glorious passes?!”. It’s easy. You just download the Disney World app and then you can sign up for the passes directly from your phone (I should also point out that you can also order food, souvenirs, etc. from the app and just walk in and pick things up, rather than waiting in line to order! Now that is magical!). The only downfall to the Fast Passes is that you can only book 3 rides at a time. Your max of 3, though, is calculated on a rolling bases, so once you have used one, another one opens back up. Availability for rides fills up fast, but it also changes throughout the day (rides that were at one time showing no availability had availability later on when we checked back in). What we found worked great was spacing our 3 passes out over the day and each time we used one, we would check back in to see what else had opened back up and slot it somewhere in between the others we had booked. This also offered us the most flexibility because we didn’t have rides booked back to back, so we were never rushing from one thing to the next, which everyone with a toddler knows is basically impossible. They were in heaven! Another tip is to bring your own water bottles. There are refilling stations throughout the park so you can re-fill your bottles throughout the day; not only is this way friendlier for the environment, but it is also much more affordable! If you don’t mind carrying snacks around with you, I would also suggest bringing some of those too. 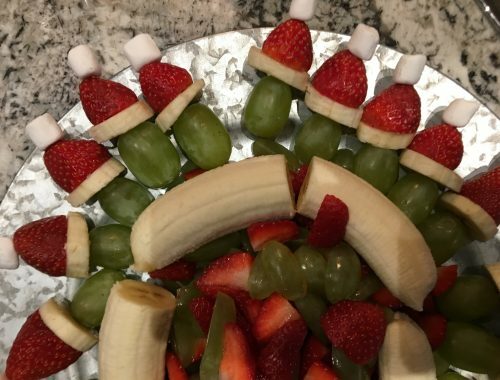 They don’t need to be elaborate, but a few of your kiddos favourites will really help; the lines for the food places are typically painfully long (again, use that Disney World app to order food ahead of time to cut down on line time for food! ), and if your kids are anything like mine, if they want food, the want it yesterday. So having something on hand to tide them over can save everyone’s sanity. If you do end up in a line that is taking a bit longer than you had anticipated, suckers work wonders! 🙂 Another suggestion is to bring your phone charger with you. There are charging stations at Magic Kingdom and if you are using that Disney World app even a fraction of how often I was using it, you are going to need to charge your phone! The whole point here is to make sure your expectations for what you will do in a day are realistic and focus on just having fun together! Disclaimer: This was photo number 723 (okay, I’m exaggerating a bit but taking pictures of littles in front of the castle with nobody in the background is no easy task!). This is the point at which I am fairly confident my husband fully regretted his suggestion to visit Magic Kingdom for Reaghan’s first birthday, but hey, he knew what he was getting into; we had known each other for over a decade when we got married so he had FULL disclosure.